Semi-formal? Evening casual? California cocktail? Wedding attire confounds even the savviest of fashionistas. But, not to worry! We’ve compiled some rules and outfit ideas below to help decipher this tricky dress code. Here’s how to figure out what to wear to your next wedding! Usually, white is a big no-no, but a big and bold floral pattern allows for some wiggle room. An outdoor wedding is a perfect time to copy mother nature herself. Rock your nature-inspired patterns for a special occasion with something like this shoulder bearing maxi-dress. Pair it with an easy pair of slip-on sandals (so you don’t sink into the ground!) throw your necessities into a clutch and voila! You’re ready to go. Less hoopla and maybe a little more laid-back, a city hall wedding is usually an intimate affair with close family and friends. 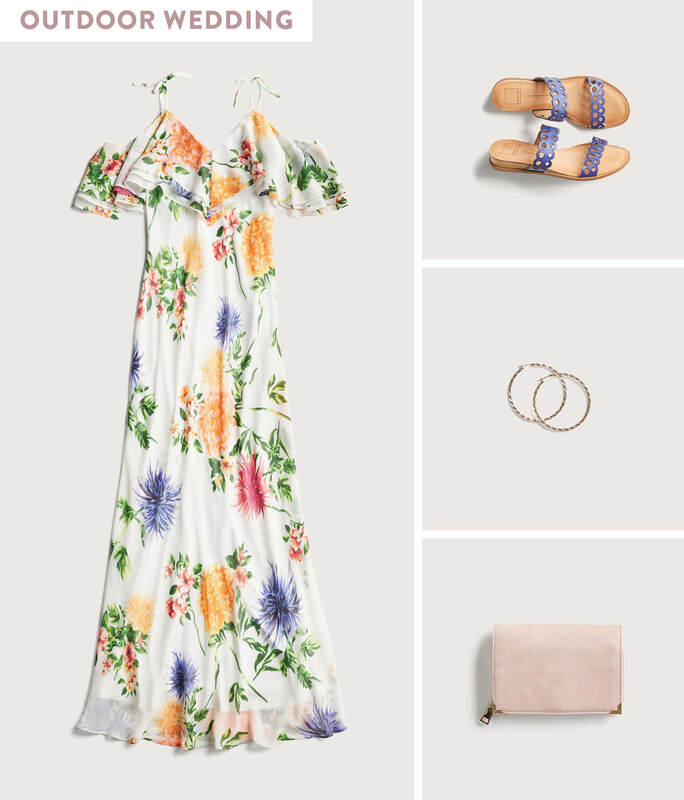 So while you don’t need to go all-out with your outfit, it’s still important to put some thought into your look (because the happy couple to-be probably put a lot of thought into their exclusive guest list!) Something chic and polished like a satin blouse and a trendy pair of trousers is a perfect way to go from city hall to celebrating downtown! Location, location, location! Destination weddings are all about where you are. 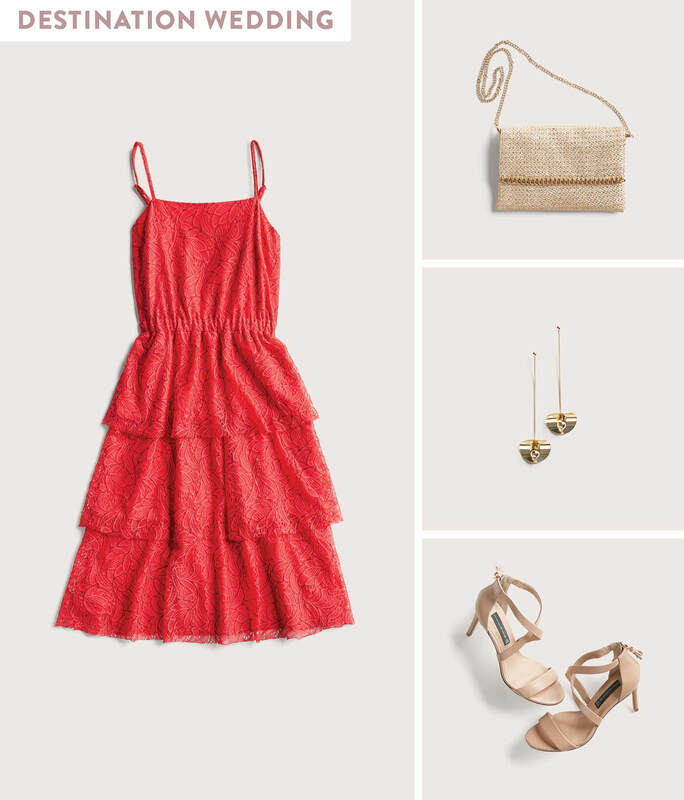 While it can be tricky to pack for a wedding (and a trip…) it’s always a safe bet to go with a pop-of-color dress, like this cranberry colored number, and a neutral pump. We recommend you keep your accessories simple because, let’s face it, travelling with a ton of extra trinkets can be a pain. This is the time to go all-out! Black tie weddings are likely going to be the most glam in terms of occasion invites, so don’t hold back when you’re deciding which outfit is best. 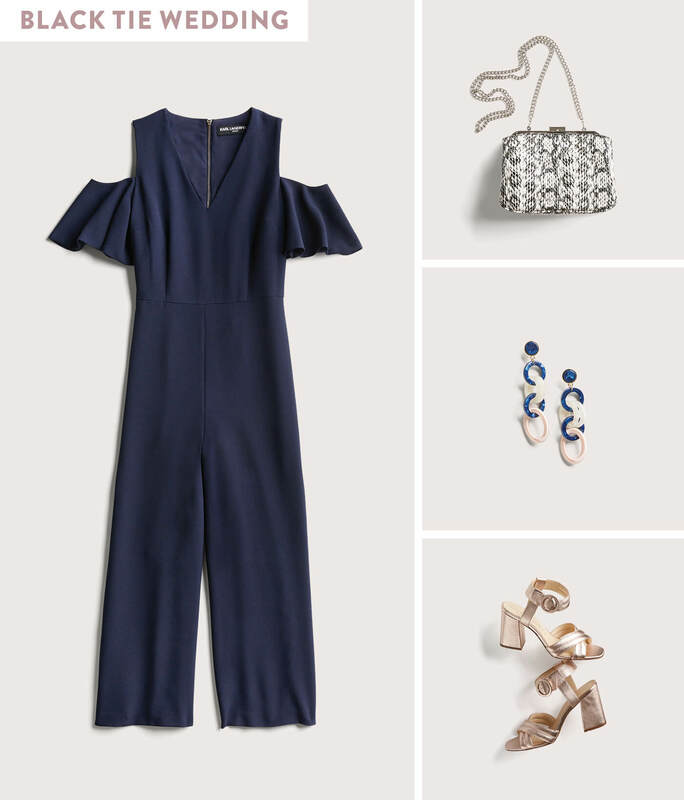 This navy jumpsuit with cut-out shoulders, gold heels and matching jewelry is a total power move. Just make sure your look doesn’t outshine the brides—because you look so awesome. You may get a ton of invitations this season, your mailbox literally flooded with RSVP’s. Don’t fret. You’ll look amazing no matter what. The most important thing to remember about these occasions is that the spouses to-be are excited to share this very special moment with you! Need the perfect outfit for your upcoming wedding? 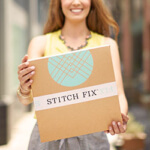 Schedule a Fix & ask your Stylist for one today!